This recipe is actually one of my mom’s creations that she shared with us recently, and it is one of those recipes you want to have multiple times a week because its just.that.good. 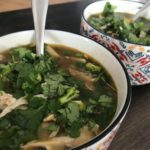 I love that it is a tasty twist on a lot of the soups I typically think up, and that it was quick, simple, and flexible. If you know me at all by now, you know I always have my Better Bone Broth on hand and that I like to keep things simple by meal prepping ahead of time. This recipe is a perfect use of leftover Easy Peasy Chicken. 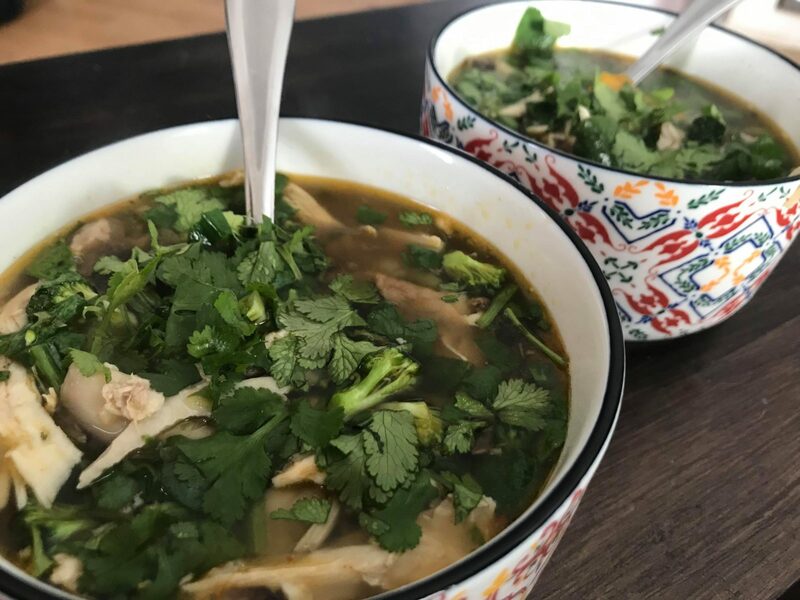 You really could use almost any produce you happen to have on hand, you could substitute the chicken for another protein such as shrimp, or you could make it vegan by using veggie broth and omitting the animal protein. The sriracha provides the perfect touch of heat at the end, which isn’t something I would’ve thought to add! It is on the table in under 30 minutes and loaded with nutritious goodness. Give this one a whirl and let me know what you think! Begin by bringing a medium sized pot of water to a boil on the stove. Mince the garlic and dice all the other produce. Heat the olive oil in a large cast iron skillet, then add the veggies. Season with the coconut aminos and "Everything But The Bagel" seasoning. Allow to saute until tender, approximately 5-10 minutes. While the veggies are cooking, boil the ramen noodles in the water according to the package instructions. In a separate medium/large pot, warm the broth and cooked chicken. When the noodles are done, drain and rinse with cold water. Set aside. Add the cooked veggies to the pot of warm broth and chicken. Stir to combine. Divide the noodles between 4 serving bowls. Ladle the broth mixture over the noodles. Garnish with cilantro and sriracha to taste. Disclaimer: The content and information found on this site is based on a holistic, whole foods approach towards wellness. What you see is based on both my training through the Institute for Integrative Nutrition (IIN) as well as my own personal research and experiences. I am not, and will never claim to be, a doctor or medical professional. The information found here is meant to educate, support, inspire, and empower you to think critically about your own personal health and well-being. I encourage my clients to be their own advocates and be well-informed regarding their own personal health needs and choices. Please consult with your physician or doctor should you have questions regarding a diagnosis, medication, or need for medical advice.